Baker Mayfield’s been in the news a lot lately. With good reason. The number-one drafted, Heisman Trophy-winning, boastfully flag-planting, sidelines crotch-grabbing, far-too-short to play the pro game, Johnny Manziel comparative is the new face of the Cleveland Browns. He is the next among a long list of quarterbacks that the NFL’s most historically, downtrodden franchise has selected to do something never done before: lead the Browns to a Super Bowl. Mayfield’s been making appearances lately. Dressed as dapper as can be, he showed up at the ESPYs where he received an award for the year’s best college athlete. More notably, he appeared on Colin Cowherd’s nationally televised radio program, clapping back at Cowherd’s perhaps founded, perhaps not criticism of Mayfield’s college antics at Oklahoma. It was the most combatively electric moment we’ve seen between sportscaster and quarterback since Jim Rome interviewed Jim Everett. Anyone who puts Cowherd in his place, which Mayfield clearly did, is okay in my book. Here’s the clip in case you missed it. Mayfield has moved on from Oklahoma and appears to have brought a level of maturity none of us outside that Norman locker room never knew existed. 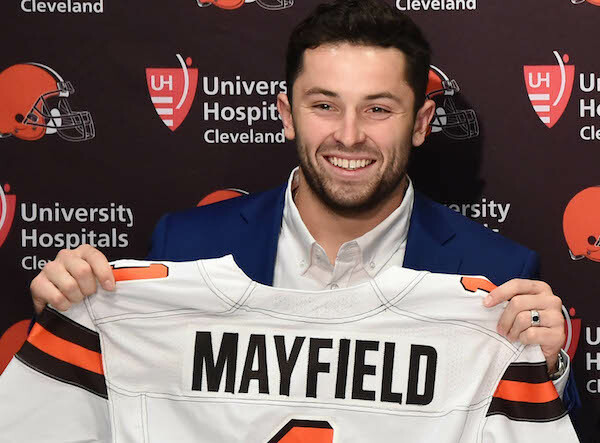 His college hijinks no longer matter as Mayfield is now a professional and looking to take the next step in his career. Let’s be honest, he’s (fortunately) no Jameis Winston who continues to set the bar low for how NFL quarterbacks should act. Since being drafted, Mayfield has toed the company line. We’ll find out much more about him when HBO airs Hard Knocks, which will shift this season’s focus to the Cleveland Browns. Cleveland is the perfect target for the network’s annual training camp expose as it has all the elements HBO looks for in a team: a marketable young quarterback, a franchise that hasn’t made the playoffs in ages and the ever-present element of drama. With everything on his plate, Baker Mayfield has to fail, right? I mean, he’s a Cleveland Browns quarterback. The odds are stacked against him. I could list the names of those who have come before him but I’d run out of internet. The last time the Browns had a winning record was 2009. They went 10-6 and Derek Anderson was taking snaps. In 2002, they went 9-7 with top drafted Tim Couch as their quarterback. That was the last time they made the playoffs. In 1994, they went 11-5 with Vinny Testaverde as their quarterback. That was the last time Cleveland won a playoff game. Those were the only three seasons of the last twenty-five that this team has finished over. 500. As if that wasn’t enough, he’s playing for a coach who has won only one game in two years. He has a top wide receiver who can’t stay on the field for a variety of personal issues. And he’s playing in Cleveland, a team that’s had less success than arguably any other team in the league for the last half century. I’ll be honest. I’ve never been a fan of Mayfield but I’m not from Oklahoma either. The media has consistently portrayed him as immature, a braggard and yet another great college quarterback who will amount to little in the pros. Just when we thought he might be sitting for a while on draft night, Cleveland did the most Cleveland thing ever. They drafted him first overall over a slew of quarterbacks that other “experts” ranked higher. Few outside the Cleveland war room understood the decision. The Browns were just fine with it. Right now, the honeymoon runs romantic in Northern Ohio. LeBron may have skipped town but the Browns once again start the season 0-0 with a team full of promise and their next quarterbacking project eager to make his mark. No one expects immediate success. Heck, it may take him a while to start. But the future is his and all Cleveland can do is hope for the best, as they always have, rather fruitlessly. I could easily jump on the anti-Baker Mayfield bandwagon and hate on the guy, finding flaws in his character and casting the bazillionth stone but what good would that do? With no dog in this hunt, I’ll be honest. At this point, I can’t help but root for the kid. Besides, if the Astros, Eagles and Capitals can all win titles, I suppose the Browns making progress isn’t outside the realm of unlikelihood, as ridiculous as that might sound today. Mayfield may fail miserably just like his numerous, Brown-clad predecessors. It is the most likely of outcomes. But if this kid can do something no one expects him to and prove his long list of haters wrong, well, that’s a story I can get behind. His journey begins now and we are all along for the ride. This entry was posted in Featured, Pigskin and tagged Baker Mayfield, Cleveland Browns, Colin Cowherd, College Football, Jameis Winston, Jim Rome, Josh Gordon, NFL, Oklahoma Sooners by Chris Humpherys. Bookmark the permalink. Preach on brother. Let the guy give it a shot & then we can throw rocks if warranted. Until then, the media should let it ride. Go take a history lesson. The Cleveland Browns have had a winning record in 57.8% of their seasons, a figure surpassed by only 7 other NFL teams. Their longest streak of losing seasons? 5 years, another record in which only 7 teams were better. Add to that 23 division championships, 11 conference championships and 4 NFL championships. Few NFL teams can boast of such a winning history. Judging the merits of a rookie quarterback in Cleveland is like evaluating the skills of a driver at the Indy 500 after you’ve given him a 1984 Yugo. I know more about Curtis Mayfield than Baker Mayfield. Question is, will he be Super Fly or another Freddie’s Dead? Cleveland Browns win total over/under for the year is 5.5 so six is a pretty spot on number. We know what they’ve done that last two seasons and six might be a little lofty but the good news is…. anything is really an improvement. Taylor is a talented quarterback. We’ll see if he fits their system. If he does, it could be a while before we see Mayfield under center at the start of a game. If he doesn’t, I can’t help but think they’ll have to redesign an offense for Mayfield, who I don’t see as the same type of QB. We shall see, I guess. I figured it was only a matter of time before some old school Browns fan corrected me on the history of the franchise. Okay, if I revised my statement to include “the Super Bowl era” or “ever since Jim Brown retired,” would that suffice? And speaking of Jim Brown, I highly recommend you pick up Dave Zirin’s latest work “Last Man Standing.” I’m currently in the middle of it. It is a brilliantly written work about the man and what he meant not only to the franchise and the league but to American cultural history. With all these first round draft picks they have compiled, they eventually have to become relevant, right? I mean, the Celtics did it. Isn’t it Cleveland’s turn? Perhaps someone in their front office should give Danny Ainge a call. Congratulations on what could so far be the comment of the year. Bakers a stud. Loved when he planyed that flag throught the heart of Buckeye nation after first embarrassing them on the field. Looking forward to watching the Clowns buttfuck yet another season to shreds. They are the anti-Ainge squared. As for Deacon Blues winning comment…would you expect anything less form a guy named for a Steely Dan jam. After all, that’s why they call Alabama the Crimson Tide. A good buddy of mine, Dr. Milhouse, you’ve read about him on here, had a Tweet last football season that went viral. Even made it on PTI. He said something about the irony of people in a town named Columbus getting upset about a guy planting a flag on a land that didn’t belong to them. Every once in a while, he’s capable of coming up with something witty. I suppose that’s better than what Steely Dan is named after.